Scheduling a sewer camera inspection on a yearly basis is by far the best way to prevent the potential for sewer pipeline related disaster at your residential, commercial, or industrial property. Thanks to advances in video technology the process has never been more accurate. It only takes one of our experienced and highly trained technicians approximately one hour to perform an on site inspection at your home, place of business, or investment real estate. It is a small investment of your time and money that may very well save you thousands of even tens of thousands of dollars in the future. 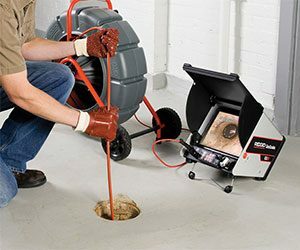 Many of our customers are curious as to how a sewer camera inspection in Edmond, Oklahoma actually works. After you contact Nu Flow to schedule an appointment one of our technicians will arrive at your property at the designated day and time. They will insert a tiny waterproof video camera into the sewer system through an access point such as a drain cleanout. The video camera is attached to a flexible rod. The technician is able to feed the rod through the entire length of the sewer pipeline, even if there are turns or bends. For example, many sewer pipelines have turns or angles upwards of ninety degrees. As the rod is being fed or snaked through the system it is taking a crystal clear video of the interior condition of the pipes. The video images are broadcast in real time back to the technician where they can be viewed on a variety of handheld electronic devices, such as a tablet or smartphone, or to a laptop computer. The video is also recorded to a DVD or in digital format for future reference. Although many property owners may be afraid of the results, the outcome of most sewer camera inspections end up showing that the sewer pipeline is in good working order. This provides property owners with the peace of mind of knowing that they are not facing expense sewer related repairs anytime soon. However, there are times that issues are discovered. Some are small enough that they do not require immediate attention. In this case the issues can be tracked with each years sewer camera inspection. If the problem is severe enough then a plan can be formulated to make the necessary repairs. Even though that is not the news that property owners hope for, it is extremely important to both discover and fix the problem. Otherwise it can turn into a major disaster such as raw sewage and wastewater backing up into the property or leaking directly into the ground. On that note, if you are having a video inspection performed because there is a major issue with the sewer system, and are putting in a claim with your property owners insurance company, than they will require a copy of the inspection, which we gladly provide. Nu Flow Technologies has been involved with the development and advancement of trenchless sewer pipe repair technology since the industry first began back in the mid 1990s. Our company has continued to bring the best equipment, tools, process, and technology to market since that time. We look forward to serving all of your trenchless sewer repair needs for years to come.